Please register via this link http://www.druckerforum.org/registration/ and take advantage of the 15% Early Bird discount. The Early Bird will close on July 15 end of business. To see the subjects that will be at the core of the Drucker Forum please check out the conference abstract and the starting blog of the series The Human Difference. Please see a more complete list of speakers and moderators on our home page druckerforum.org including Henry Mintzberg, McGill University, Gillian Tett, US Managing Editor, FT, James P. Keane, CEO Steelcase, Charles Edouard Bouée, CEO Roland Berger, Tom Davenport, Babson College, Sherry Turkle, MIT, Kevin Roberts, Executive Chairman, Saatchi & Saatchi, Adi Ignatius, Editor-in-chief, HBR. 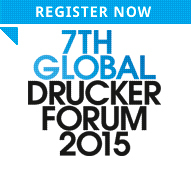 The Drucker Challenge addresses itself to the young generation from around the globe. Essays can be submitted no later than July 15. Please find the terms and the rules on the Drucker Challenge site. The BBC program produced last year and the interviews with winners demonstrate how important and attractive this program is. For those who are interested to support communication about this program - please send request with subject "Drucker Challenge" to info@druckerchallenge.org to receive promotion package. Sponsorships not only help us to ensure the funding of the Forum but provide great value for sponsors. Current Gold and Silver sponsors are Steelcase, Scrum Alliance, EFMD, Roland Berger and Get Abstract. For more info on sponsorship for the Drucker Forum and the Drucker Challenge Contest please contact us via contact@druckersociety.eu to receive the sponsorship package.